Make fashionable clothes for your dog from your old sweaters. Sometimes tiny dogs get cold, even in mild weather ... all right, and sometimes you like to dress up your little friend just because it's so cute. 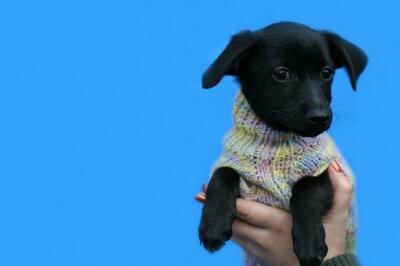 It's easy to make a dog sweater from the sleeves of one of your old sweaters. She'll be fashionable and warm. Measure the length of your dog's back from the base of her neck to the base of her tail, using the tape measure. Also measure the width of her chest between her front legs and the length of her neck from her jaw to where her shoulders begin. Cut a sleeve from the sweater to the same measurement as your dog's back, using the scissors. For instance, if your dog's back measures 7 inches, use the tape to measure 7 inches up from the cuff edge of the sweater, and cut it at that point. Mark the sleeve with a straight pin to the same length as your dog's neck measurement. For example, if your dog's neck is 4 inches long, measure 4 inches from the cuff edge of the sleeve, and place a pin at that point. Cut armholes into the sleeve just below the pin marking the neck. Use the chest measurement to get the correct spacing. As an example, if your dog's chest measures 3 inches, then you will cut two 1-inch slits in the sleeve, making sure they are 3 inches apart. Remove all pins. Slide the sweater over your dog's head, and gently pull her legs through the arm holes. Fold over the cuff of the sleeve for a turtleneck if it is uncomfortably long for her. Using a small-weave sweater rather than a large weave may let you avoid having to hem the edges of the sweater. Large-weave knit will unravel, so it is best to finish the edge with the zigzag setting on a sewing machine. Depending on the size of sweater and the size of your dog, the cuff edge might be too tight around your dog's neck. Before beginning the project, measure around your dog's neck and compare it to the cuff opening, or just slide the sleeve over your dog's head to make sure it won't be too tight. If the cuff is too tight, you can cut it off before your measure and cut the sleeve to begin the project. Be careful that your dog does not become overheated while wearing a sweater or other clothing. Dogs dressed in clothing cannot communicate their intentions to other dogs properly and otherwise behave as natural dogs. Small indoor dogs may need some insulation or rain-proofing if they venture outdoors, but clothing for the sake of fashion or costuming can make some dogs uncomfortable or stressed, and can even start a fight. "How to Teach Your Dog to Do ""Peek a Boo"""
Are Wild Mushrooms Poisonous to Dogs? What Human Foods Will Make a Dog Sick?